The price listed was correct at the time of publishing on this website, however may change without prior notice. Only the pricing given to you by your consultant should be considered the final correct pricing applicable to your booking. The above COST IS PER ADULT SHARING A CABIN based on 2 adults, including accommodation, all meals, snacks and activities. Single supplements applies. EXCLUDED Port & Baggage Fees, Mandatory Insurance and Service Fees (Standard charges at R775 per person), Subject to availability. Prices are quoted in South African Rands. Please note that all prices are subject to currency fluctuations, MSC Cruise dynamic pricing policy, fuel surcharges and may change without notice unless paid in full. For the first time in South African waters let’s welcome MSC Musica. Enjoy an exciting 2 night cruise on the MSC Musica in Cape Town. The ship departs from Cape Town harbour on Friday the 18th of Jan 2018 and cruises to Nowhere in the Atlantic Ocean, and arrives back in Cape Town on Sunday, the 20th of Jan 2018. You might be asking yourself "just where exactly is nowhere?". 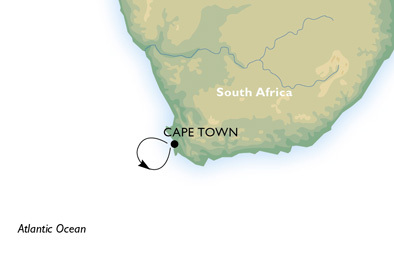 Rest assured that nowhere is somewhere, indeed: This cruise simply go out to sea for a short sailing that's devoid of ports, where the main destination is the ship. Our 2 night cruises offer the perfect weekend getaway experience for those who are short on time, but in need of a perfect fun filled break! Ideal for first time cruisers, for couples or families wanting a quick escape, or for those wanting to celebrate their own personal occasions on board like bachelor parties or milestone birthdays, a 2 night cruise to nowhere allows for a fabulous away from home experience. Overall, these quick cruise-to-nowhere escapes pack in plenty of fun, allowing cruisers to leave it all behind on land and get lost at sea for a carefree 3 day trip. MSC Musica is the magnificent and very modern MSC Cruises most recently refurbished in 2016 (it debuted in 2006). Discover this big cruise ship, which offers the very best in relaxing and in cruising comfort: steaming sauna, bubbling whirlpools, well-equipped gym as well as the elegant wine-tasting room, the original sushi bar and the tone is set on the welcoming atmosphere. Most of the cabins have balconies, ideal for relaxing and enjoying your memorable holiday. Come and cruise at the very best time to sail as the seas are calm and the weather sunny, ensuring the best possible setting for the best possible experience. Cabins have the following amenities: 2 single beds that can be converted into a double bed (on request), spacious wardrobe, bathroom with shower, interactive TV, telephone, Internet connection (payable), mini bar, safe, air-conditioning. Once the booking has been made, you will have 48 hours to make a non-refundable R 3,500 per cabin deposit. Booking balance will be due 80 days prior to departure. For bookings where we are already within 80 days prior to departure, full payment will be required within 48 hours. Cancellation penalties: Deposit 100% non-refundable / 79-60 days prior to sailing 50% of cruise fare / Less than 60 days before sailing 100% of the cruise fare. Up to 2 children under 18 sharing a cabin with their parents or responsible adults, cruise free but only pay for the applicable Port, Baggage and Service charges (R730 per child 13-17yrs and R615 per child 2-12yrs) . This offer is subject to the availability of 4 berth cabins. Also applicable with 2 children under 5 years in Balcony Cabins.